The statement then acknowledges the assistance that private guards and, government-provided vessel protection detachments (VPDs) can provide. Noted the concern of some coastal states in the Indian Ocean region about the increasing use of armed guards by commercial ships in the proximity of such states, and invited [Working Group] 2 and [Working Group] 3 to discuss the implications of the use of such guards, and potential ways to address the related concerns. In addition to legal issues such as when the use of force is justified, some new ones have presented themselves. Private Security Companies were always confronted with the difficulty of complying with multiple legal regimes in different ports of call. While a point of origin might permit possession of some weapons, perhaps the next port of call would not. In some instances, this led to the disposal of weapons at sea. See also here. 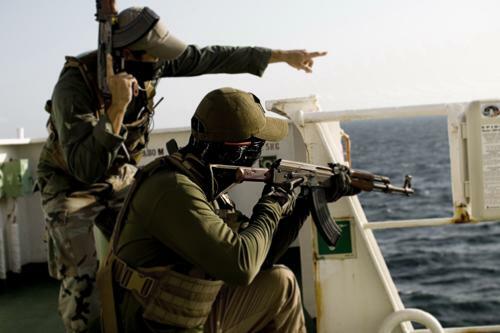 Now, in order to avoid these conflicting legal regimes, some private security companies have reportedly, stored guns aboard floating armories on the high seas in order cut costs and circumvent laws limiting the import and export of weapons. As the statement of the Contact Group makes clear, a consensus position on these issues is still some ways off.